We launched our indigo dye knit series with the classic crewneck sweatshirt but now we're circling back to cover all the zip hoodie fans out there. Indigo dyed to perfection and made right in the USA, this is zip hoodie nirvana. Another first for us, we're finally bringing the beauty of indigo dye to our much-loved full-zip hoodie. Today we have it for you in two glorious indigo colors at a value you simply won't find anywhere else. Pick up both at an even better value. The star of this show is clear - indigo dye. You simply can't get colors this beautifully rich using any other type of dye. Outside of denim, indigo dyed fabric is rare. We've found the rarest to be knits, which is why it took us years to find this style. This version is an impossibly deep, inky dark indigo. With time, it will evolve and age like your best pair of raw denim. The color will soften around the hems first as it takes on a wear pattern unique to you. We sew this 14 ounce french terry up in our popular full zip hoodie style. It's nicely fitted, with all the right details from YKK zippers, to thick cuffs and hem to the perfectly sized hood. Indigo beauty applied to an infinitely versatile garment at a huge value. Our sweatshirts line up in size with our other garments. If you wear a small t-shirt, jacket or woven shirt, we recommend a size small. The style is traditional, but the fit is modern. The shoulders are fitted and the body is slightly tapered, but roomy enough so that it's superbly comfortable. Finally, the length hits just right so it falls below the waist line, but does not cover your entire backside. Lay the t-shirt flat and double the measurement across the chest 1" below the underarm seam. Measure at the center back from the bottom of the rib to the hem of the shirt. 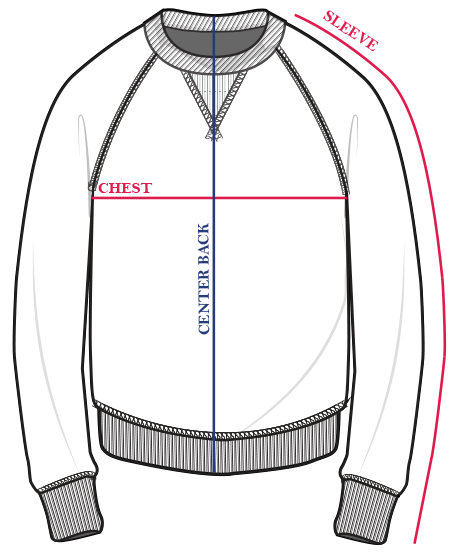 Measure from the neck seam, down to the end of the sleeve.